People offer incense, hoping for peace at Hokon no To Peace Memorial Ceremony. At Hokon no To tower in the Nishiemae district of Ie Village on April 21. 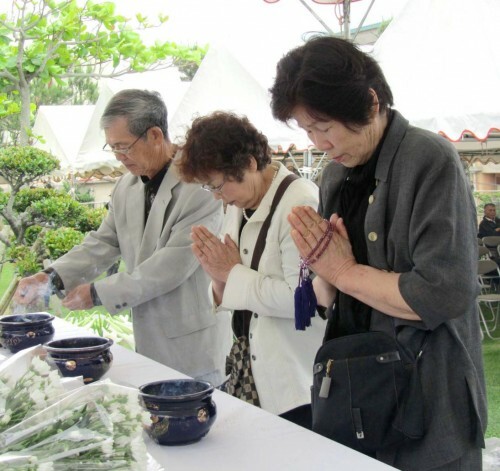 Ie Village held a peace memorial ceremony on April 21 at Hokon no To tower in Mura Nishiemae to mourn 3,500 villagers lost during the Battle of Okinawa. About 350 family members of the victims and villagers solemnly laid flowers in memory of the war victims and prayed for a peaceful world. Another memorial service was held on the same day at the Ie-jima lighthouse, which was destroyed during the war. The people working there and their families lost their lives. A minute’s silence followed the sound of the ferry whistle at Ie Port at 1 p.m.